Pick up from your hotel at Taba & return. Meet & assist service at Taba Port. will pick you up from your hotel in Taba via a moderrn air-coditioned vehicle to Taba port, taking a ferry boat to Aqaba port, where you are met and assisted by our representative to be transferred directly to Petra is situated about 3 hours south of Amman, 1 hour north of Aqaba Petra is surrounded by towering hills of rust-colored sandstone which gave the city some natural protection against invaders. 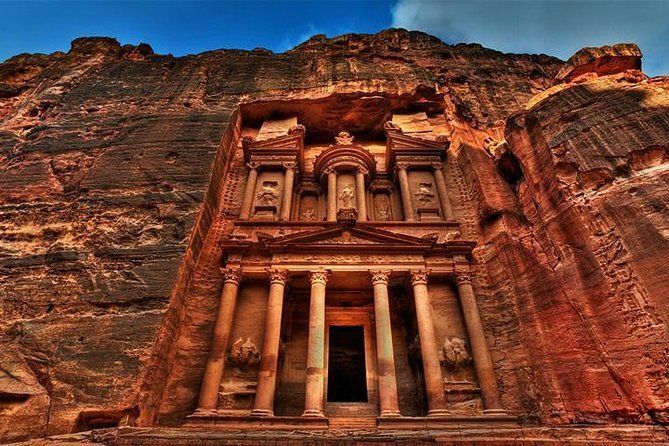 In Petra, you see the wonderful red rose rock city, the city of the Nabateans, the lost city (all carved in the mountains) riding horse to the Siq (canyon), the natural crack in the rocks to the Roman Theatre, Royal Tombs, the Roman colonnaded street, Qasr Al-Bent and then the archaeological museum. Lunch, then back to Aqaba city for a short city tour and free time for shopping. After your day tour you will sail back to Taba port then you will be transferred to your hotel in Taba.